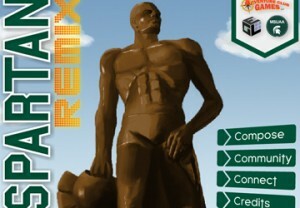 Spartan Remix is a web-based music construction game that allows players to interactively build, mix, and share their own version of the Michigan State University fight song. The game was developed for the MSU Alumni Association to help build school spirit and maintain a relationship with alumni. The game features a number of social networking tie-ins to promote the spread of the game virally across the Internet. The game was created in conjunction with Adventure Club Games, which is an East Lansing-based game company founded by alumni from our game specialization.